In February 2018, MetOcean Solutions deployed five solar powered wave buoys (Spotters) in the Southern Ocean in partnership with Spoondrift and the Defence Technology Agency. Now, one year later, these buoys have travelled more than 6500 km and are currently crossing the stormy waters of the Drake Passage, the body of water between South America’s Cape Horn and the South Shetland Islands. DRIFT TRACK AND SIGNIFICANT WAVE HEIGHTS MEASURED OVER THE LAST year. The Southern Ocean programme is helping understand waves in the region and their impact on the climate system. The operation was led by MetOcean Solutions’ Technical Support Liaison Dr Aitana Forcén-Vázquez, Principal Investigator for Physical Oceanography aboard the Research Vessel Tangaroa on the science voyage to Antarctica with NIWA and the University of Auckland. “The buoys were deployed in the Southern Ocean, home to the strongest current on Earth; the Antarctic Circumpolar Current. The Southern Ocean is the circular ocean that flows uninterrupted around Antarctica and occupies almost one quarter of all the world’s oceans. It plays an important role in the climate system, cycling heat, carbon and nutrients. Persistent storms and the lack of landmass in the Southern Ocean result in large fetches and strong winds - ideal conditions for generating large waves,” states Forcén-Vázquez. This is the first time that this kind of wave buoy has been deployed in the Southern Ocean. It is the perfect scenario to test the response of this new technology in an energetic open ocean. If effective however, they could revolutionise the way we monitor remote ocean basins through a constellation of drifting buoys. The wave buoys (Spotters) deployment. “These buoys (Spotters) are surprisingly easy to deploy, very light and easy to handle, and can be lowered in the water by hand using a line. As a result, you can deploy them in almost any kind of conditions, which greatly facilitates Southern Ocean operations,” complements Forcén-Vázquez. Spoondrift developed the Spotter buoy as a citizen sensor to drive distributed ocean sensing and democratized data access. Tim Janssen, CEO of Spoondrift, explains “The Spotter buoy is designed to be easy to use, low-cost and solar-powered. From the Spotter Dashboard the user can access data and change settings on the device. The current generation Spotters have a battery protection feature that triggers a hibernation mode during extreme temperatures and extended periods of darkness in the Southern Ocean winter. Spoondrift continuously innovates its technology to simplify deployments and provide high-latitude options to ensure continuous data acquisition in extreme conditions”. 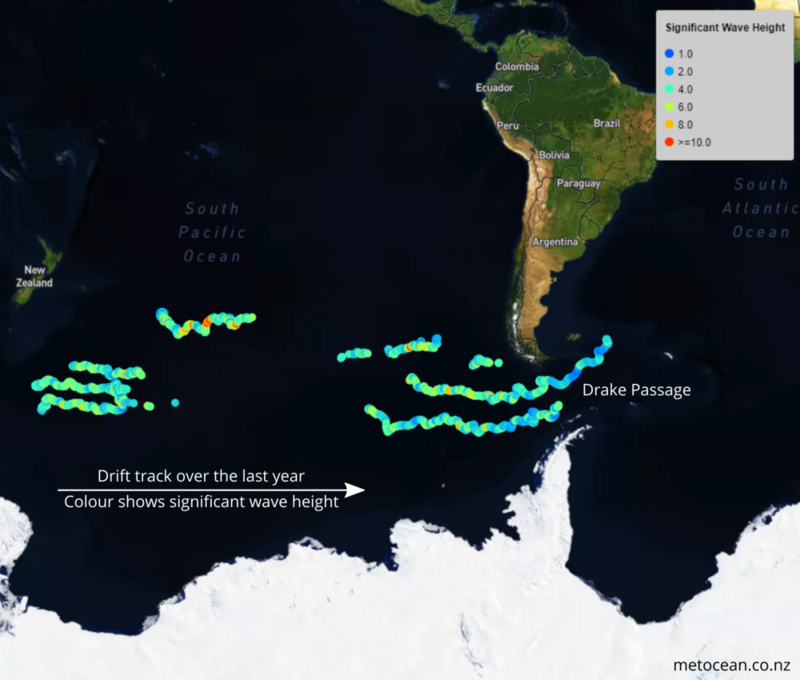 In addition to the five drifting buoys, MetOcean has the world’s southernmost open ocean moored buoy which last year recorded the highest wave in the Southern Hemisphere. In recognition of the importance of this programme of work, this data is freely available to the scientific community. MetOcean Solutions is a science-based consultancy wholly owned by MetService. MetOcean specialise in providing numerical modelling and analytical services in meteorology and oceanography. Last night, the MetOcean Solutions wave buoy moored in the Southern Ocean recorded a massive 23.8 m wave. “However, it is likely that the peak heights during this storm were actually much higher, with individual waves greater than 25 m being possible as the wave forecast for the storm show larger wave conditions just north of the buoy location. Also, to conserve battery during the one year deployment, the solar-powered buoy samples the waves for just 20 minutes every 3 hours then sends the data via a satellite link. During that 20 minute recording period, the height, period and direction of every wave is measured and statistics are calculated. It's very probable that larger waves occurred while the buoy was not recording. Simulation of the storm: wind and mean sea level pressure (left) and significant wave height (right) passing over south New Zealand. The ‘significant wave height’ is the WMO standard value to characterise a sea state - approximately the average of the highest third of the measured waves. During this storm, the significant wave height reached 14.9 m. This is also a record for the Southern Ocean, but falls short of the 19 m world record buoy measurement that was recorded in the North Atlantic during 2013. The Campbell Island Wave Rider Buoy was moored on 2 March 2018 at Campbell Island, New Zealand’s southernmost estate and an ideal spot to sample the complex directional wave spectra from the Southern Ocean. The Southern Ocean wave studies are a collaborative project with New Zealand Defence Force, Defence Technology Agency and Spoondrift. As part of that program, MetOcean Solutions has deployed seven instruments to collect wave data, using one moored and six drifting buoys. All data are freely available to the scientific community and can be viewed in real time. For further information and data access see www.metocean.co.nz/southern-ocean/ or contact us at enquiries@metocean.co.nz. MetOcean Solutions is a wholly owned subsidiary of state-owned enterprise, Meteorological Service of New Zealand (MetService). MetService is New Zealand’s national weather authority, providing comprehensive weather information services, to help protect the safety and well-being of New Zealanders and the economy. In 2017, MetOcean Solutions partnered with New Zealand Defence Force and Defence Technology Agency to deploy a scientific wave buoy in the Southern Ocean. Moored 11 km south of the remote Campbell Island, the buoy collected 170 days of great data - including the May 2017 storm with a whopping 19.4 m wave! By July however, the perpetually rough seas caused fatigue in the mooring line and the buoy started on a new and rather intrepid journey toward Chile. The buoy was launched on 2 March 2018. Meanwhile, the mission to collect wave data for NZ Navy’s SubAntarctic applications continues, and this year’s initiative has seen another wave buoy positioned at Campbell Island. This is New Zealand’s southernmost estate and an ideal spot to sample the complex directional wave spectra from the Southern Ocean. On 2 March 2018, MetOcean Solutions manager and senior oceanographer Dr Peter McComb led the buoy deployment from the Offshore Patrol Vessel HMNZS WELLINGTON, with support from Sally Garrett and William Coldicutt from the Defence Technology Agency. Offshore Patrol Vessel HMNZS WELLINGTON. This year however, the mooring design has been modified to better suit the harsh conditions and reduce the risk of mooring failure before the servicing mission next summer. “We have to find the right balance for robustness in the mooring system while maintaining scientific integrity of the data. It is certainly a challenge working in these southern latitudes,” admits Peter. “But every month of data adds significantly to our knowledge of this ocean basin, so it’s a very worthy challenge”. All data from the wave buoy programme is openly available for research, and interested members of the public can check the Southern Ocean wave conditions in real-time at http://www.metocean.co.nz/southern-ocean. Southern Ocean wave buoy heading for Chile! On Friday 28 July, New Zealand’s Southern Ocean Wave Buoy started drifting eastward with the ocean currents. The HMNZS OTAGO deployed the buoy in February 2017 for a collaborative research project between the Defence Technology Agency and MetOcean Solutions. From the chilly waters just south of Campbell Island, the buoy has been sending back vital wave spectral data via a satellite link. These data will now be used by the New Zealand Defence Force to design the next class of patrol ships suited to the harsh Southern Ocean climate. MetOcean Solutions have a research project to develop a global wave model with improved performance in the Southern Hemisphere, and will use the data to verify the next generation of model physics. The wave data will also be made freely available to the international research community. The Southern Ocean is known to play an important role in the climate system - cycling heat, carbon, and nutrients. Waves modulate the air-sea fluxes and the swells generated in this region have far-reaching effects, contributing significantly to the wave climate in all the major ocean basins. Drift track and significant wave heights measured over the last 14 days. Another positive outcome is the realisation that our research project is not over yet - the buoy continues to measure wave spectra and send its data via the satellite link as long as there is sufficient solar power. MetOcean Solutions plans to deploy another wave buoy at the Campbell Island site in February 2018, with the goal of establishing a long term sub-Antarctic wave monitoring station. The buoy was deployed in February 2017.